Little Dot Creations — Lovelin. | Limited Edition Clothing. With such a vibrant creative scene in Glasgow you are never that far away from a finding your self among the quirky stalls of a trades fair. It was at one of these said fairs that we first discovered the mind melting works of Little Dot Creations. With such a unique style of art and just all round cuteness of the work we knew we had to collaborate on a limited edition tee. All our interviews start with the same generic intro question so...For those who do not know about you, tell us who you are and what you do? I’m Suzi Plunkett and I graduated from DJCAD in 2012 with a degree in Jewellery and Metalwork Design. In 2013 “Little Dot Creations” was born! Little Dot Creations offers a range of light-hearted animal treats for adults and children alike. Armed with my tiny pens, I create my illustrations using thousands of little dots and circles. Designing prints, homewares and greeting cards, everything is handmade in my little studio. I like to draw inspiration from my love of children’s stories, fairy tales and my life growing up in rural Dumfries and Galloway. As your name suggests (Little dot creations) your artwork is created using dot work. All the memories from art class tell us that this is a very hard and mind melting process, Why were you drawn to using this style of art? There’s no getting around the fact that it is extremely time consuming but it’s so satisfying once something is finished to take a wee step back and look at what’s been created using something as simple as dots and circles! Plus once I really get into a piece, I guess it becomes kind of like meditation – it’s easy to get carried away and then look at the clock and realise you haven’t stopped drawing for 8 hours and you’ve missed the post office run. To date how many dots do you think you have used throughout your work? We loved the work you produced revolving around puns, most of which are a bit cheeky, Is there reason why or are you just a bit cheeky yourself? I once wrote a book in rhyme about a superhero dog and for a few days I couldn’t stop speaking and thinking in rhyme. That’s kind of what happened with the puns! I was telling pun jokes and got really carried away and everyone has loved them so far. I love a cheesy joke so that’s probably where they came from! Out of all the art you have produced if you had to pick one piece what would be your favourite? I’m really pleased with how Peggy has turned out so that’s definitely up there with the favourites, but I think my most favourite of all is my Dodo. 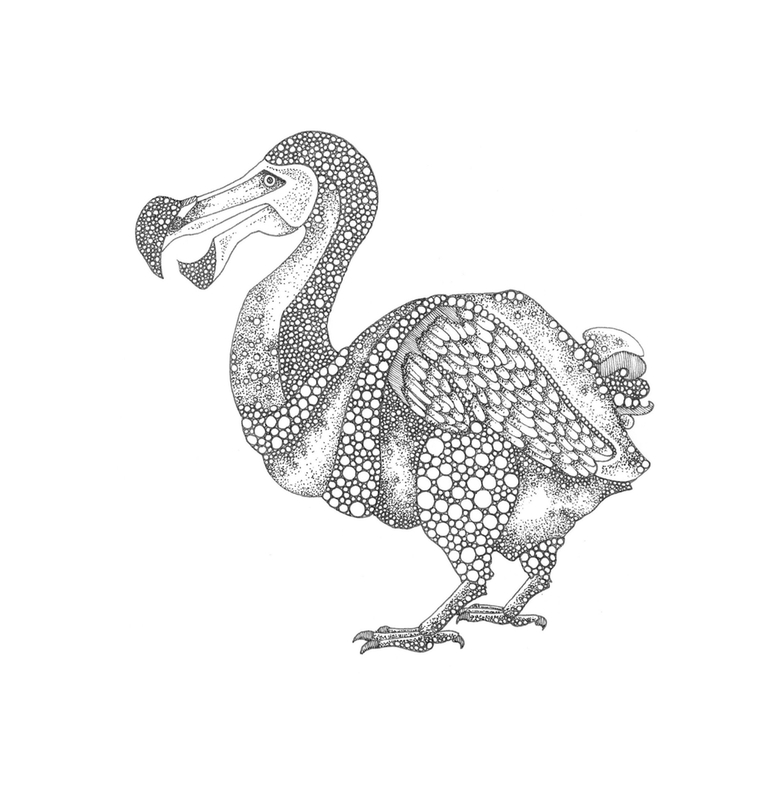 I think the Dodo is my spirit animal – they were very trusting and a little bit naïve. And of course I love Alice in Wonderland. Did you know there’s a theory that the Dodo in the Caucus Race is thought to be a stand in for Lewis Carroll himself? His real name was Charles Lutwidge Dodgson and it’s thought that because of his terrible stutter, he struggled to pronounce his surname, and that is why he identified closely with the Dodo! Fun fact of the day. “Peggy” The Pegasus is the lovely piece you designed for us and our limited edition campaign for Cerebral Palsy. Can you tell us a little about your design and your thought process behind it? My cousin has Cerebral Palsy and when he was born, his parents were told he probably wouldn’t see his first birthday. He’s now in his 50s and still laughing! Of course when we think of horses we associate them with strength and stability, so add some wings and you’ve got yourself something pretty special! The Pegasus is often a symbol of aspiration – to achieve the greatest heights of accomplishment. I thought that was the perfect positive message to fit the campaign, plus who doesn’t love a little bit of magic! What’s next for Little Dot Creations? I’ve been working on some really exciting commissions for a Glasgow restaurant (including my BIGGEST not so Little Dot Creation so far!) and I’m teaming up with a fantastic chocolate company to help design their packaging, as well as expanding my product range on my online shop. I’ve just moved back up to Glasgow so I’m looking forward to exploring the exciting opportunities the city has to offer.